Dimensional shingles, also known as architectural shingles, are asphalt shingles with an enhanced aesthetic appearance compared to traditional 3-Tab shingles. Dimensional shingles have multiple layers of shingle material, and tabs of varying sizes unlike the single-layer repetitive sized tabs of traditional 3-tab shingles. This gives dimensional shingle the dimensional appearance hence the name. There are many other benefits to dimensional shingles beyond simple their appearance. Since dimensional shingles consists of 2 layers and require more material to manufacture they are heavier and also sturdier and more resistant to being ripped off a roof during storms and strong winds up to 130 mph. Dimensional shingles are also offer a better barrier to rain and hail than single layer 3-tab shingles. 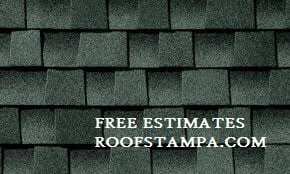 The lifespan of dimensional shingles is usually 25-30 years however 40-50 years isn’t uncommon with the higher end shingles. Obviously the more materials required to produce dimensional shingles means they are more expensive than traditional 3-tab shingles. You should expect to pay around 20% more for dimensional shingles than you would pay for 3-tab shingles.